Conveniently located just 9 miles west of Chicago’s loop, the Oak Park area has piqued the interest of domestic and international visitors for decades with its marvelous architecture and rich cultural history. However, it should come as no surprise that there’s more to the Oak Park area than notable architecture – so much so that it was named one of the top 10 neighborhoods in the nation by the American Planning Association. It’s a family-friendly, charming collection of communities where residents and visitors alike come together to take advantage of the summertime's popular seasonal events and outdoor attractions. Here are some of our favorite things to do during warmer months, from zero-waste beer festivals to silent film festivals. Start your weekends early at Thursday Night Out in Downtown Oak Park, Thursdays from 5-9PM through August 30th. Purchase a dine-around booklet, good for 4 eligible menu items, and dine al fresco at any of the 20 participating restaurants while enjoying live music and free entertainment under the stars! Produced by Seven Generations Ahead, the Micro Brew Review, the largest zero-waste beer festival in the Midwest, takes place on Saturday, August 18th in Downtown Oak Park. 70 Midwestern breweries will be pouring samples of more than 200 of their finest craft beers, while attendees can also purchase grub from local restaurants and bop along to live musicians. Welcome the weekend among friends, neighbors, and libations at Uncorked at the Oak Park Conservatory. This monthly social event, on the fourth Friday of the month June through September, features live music, wine and craft beer, passed appetizers, and a local artisan market - all against the lush, colorful backdrop of the conservatory's outdoor gardens and showrooms. Stock up on the freshest regional produce, flowers, spices, baked goods, and more at farmers markets in the Oak Park area. The Oak Park Farmers Market runs every Saturday from 7am-1pm and has earned a reputation as one of the state’s best with its live bluegrass tunes, high-quality produce, and homemade cake donuts. Saturdays from 8am-1pm, the Brookfield Farmers Market welcomes a rotating mix of local farmers with sustainably grown Midwestern produce alongside fresh coffee, pastries, and more. Those looking for outdoor markets with historic backdrops should check out the Riverside Farmers Market each Wednesday from 2:30-7PM, offering an assortment of locally sourced products ranging from pizza to smoothies. Revist the bloody roots of the Oak Park area's major hoodlums. The There Goes The Neighbor Hood Gangster Tour showcases 15 homes in Oak Park and River Forest once owned by prolific gangsters like Tony Accardo and Paul Ricca. Guide and mob historian John Binder sprinkles in amusing tidbits about the criminals' time spent in these historic homes and their lasting connections to the community. 2018 tours will take place on June 10th, July 8th, September 16th, and October 14th, and tickets are available for purchase at the Oak Park Visitors Center. Oak Park is home to the world's largest collection of Frank Lloyd Wright-designed structures, and warmer months offer visitors a unique chance to explore the historic neighborhoods on a guided bicycle tour. Pedal Oak Park, occurring weekends June through September, showcases 21 Wright designs including Wright's Home and Studio, Frank Thomas House, Heurtley House, and Furbeck House. Grab your bike and gear up for a leisurely ride through the charming and architecturally rich communities in the Oak Park area during Wright Ride on Sunday, August 19th. This popular cycling event caters to riders of all skill levels with 10, 30, 50, and 68-mile routes, all of them showcasing some of the area's finest architectural landmarks - including more than a dozen landmarks designed by Wright himself. Kick off your summer weekends unwinding at Broofield's Kiwanis Park with Summer Concerts in the Park. Every Friday through August 10th, talented regional musicians hit the stage and perform everything from country to soul, while attendees can play a game of disc golf or go for a leisurely hike. Cap your Sundays through August 19th with Oak Park's Summer Concerts in the Park in the scenic, low-key Scoville Park. This local favorite queues up an impressive roster of performers, ranging from modern jazz and blues performers to classic, family-friendly rockers. 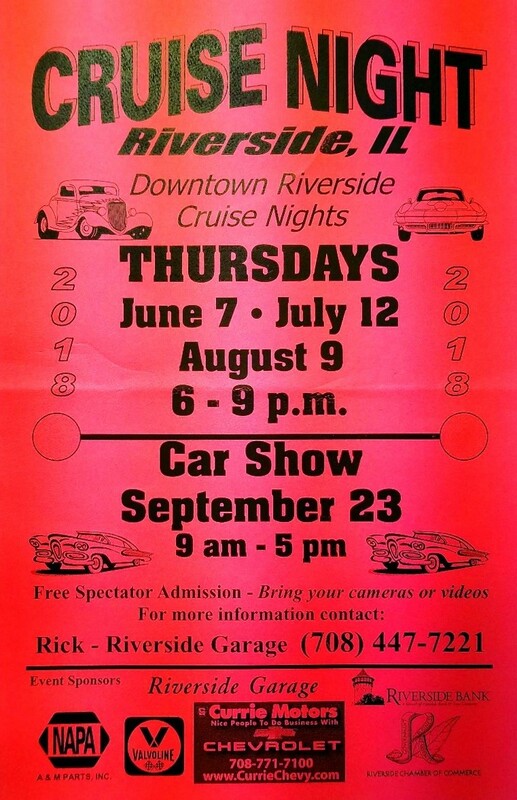 Join hundreds of regional car enthusiasts for Riverside Cruise Nights, taking place in Riverside's historic downtown from 6-9PM on various Thursdays throughout the summer (June 7th, July 12th, and August 9th). These family-friendly celebrations of classic car culture offer free spectator admission, local bites, and scores of free giveaways. Arts and culture enthusiasts are invited to mix, mingle, and sip cocktails during Friday@Hemingways, a brand new social engagement event occurring the third Friday of the month from April through November at Ernest Hemingway's richly historic birthplace home. Hear poetry, see music and dance performances, and admire paintings from local artists as you sip cocktails and snack on bites from popular nearby restaurants. The Oak Park Festival Theatre, the Midwest’s oldest professional outdoor theater group, has been entertaining locals and visitors since 1975 with its fresh takes on classic stories. The 2018 season launches on Saturday, June 16th with You Can't Take It With You, a laugh-a-minute tale about an oddball family meeting stuffy future in-laws, and is followed by The African Company Presents Richard III, a behind-the-scenes comedy that sees a successful Black theater troupe squaring off against a prominent white company in 1820s Manhattan. Savor art, food, wine, and music the way the Europeans do during Art Dans la Rue, a French street festival on Tuesday, August 7th from 2-9PM. This family-friendly affair features face painting, can can dancing, crepes, beignets, macarons, baguettes, a French-inspired art exhibit, live music, and more. Silent film festivals might not evoke images of noisey spectators, but the Pleasant Home Foundation's annual Silent Movies on the Porch event continues to draw crowds and generate buzz heading into its sixth year. A carefully selected lineup of remarkable turn-of-the-century silent films are screened for guests on the mansion's sprawling covered porch, while a gifted piano accompanist enhances the experience with musical improvisations and unique compositions. Select Fridays throughout the summer, the Village of Brookfield invites community members to post up with a blanket or lawn chair and enjoy a family-friendly flick screening. Movies begin at sundown in the sweeping Ehlert Park, with this year's schedule comprising the toe-tapping The Greatest Showman on Friday, June 15th and Disney/Pixar's Coco on Friday, August 17th. This is just a small sample of all the great things to do in the Oak Park area this summer. Check out the calendar of events for more festivals, and download the area visitor guide for more ideas.